Today I received confirmation of my 2018 Spring Turkey Harvest Permit from the DNR. It seems that turkeys have always been on our landscape. They are a frequent visitor to in-town feeders and can be seen feeding in area farm fields most every evening. This was not always the case however. 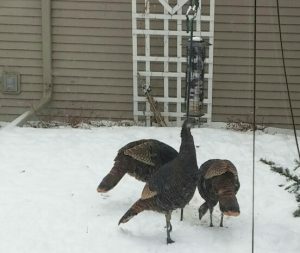 Forty plus years ago, there were no wild turkeys in Wisconsin. The last wild turkey was sighted in southern Wisconsin in 1881. In 1976, turkeys were first successfully reintroduced back into Wisconsin. The turkeys came from Missouri in a exchange of three ruffed grouse for each turkey. These turkeys were released into Vernon County, in southern Wisconsin, and prospered. Later some were trapped and moved into adjacent counties and again prospered. As the stocking continued and turkeys continued to do well and expand their territory, the DNR considered moving them into the Pierce, Dunn and St Croix Counties. The northern limit of the wild turkey population, back in the 1800’s, was a line from Prairie du Chien across the state to Green Bay. Our local DNR Wildlife biologist, at that time, told us that wild turkeys would not be able to survive north of highway 94! The habitat and harsher winter weather conditions would not allow it. Over time 49 counties received stocked birds while turkeys moved into the remaining 23 on their own. Thankfully, our turkeys proved to be more resilient than predicted and now each of our 72 counties in the state, all the way up to our northern tier of counties, has a viable, harvestable, population of wild turkeys. The first spring hunt occurred in 1983 with 1200 hunters harvesting 182 turkeys. Last year, the 2017 spring hunt total harvest was 43,305 birds. In the spring, only males can be harvested. We now also have a fall season where both sexes are fair game. Dogs can also be used to hunt the turkeys in the fall. The Eastern Turkey is the wild turkey “strain” we have in Wisconsin while the Merriam is the turkey found in North Dakota. Harvesting various turkey strains including Eastern, Merriam, Osceola and Rio Grande is called a “Grand Slam” while also bagging the Gould’s turkey found in the southwest and Mexico gets one the “Royal Slam”. Wisconsin is divided into 4 zones and each zone has a certain number of permits allotted to it for turkey harvest over several time periods. If any left-over permits remain, they can be purchased after the permit primary drawing. A small game hunting license and a special Turkey Stamp is needed to hunt them. Money from the sale of the turkey stamp goes into a dedicated fund to be used only for turkey habitat improvements. These stamps are also highly collected. Our Eastern turkey is a very beautiful bird. The adult males are called “Toms” while the young males are called “Jakes”. Both Toms and Jakes have spurs, as do rooster chickens and pheasants. However, the Jake’s spurs are nubs compared to the sharp spurs of Toms. In the spring the Toms and Jakes compete for the females with struts and dances but in a head to head stand-off, the Toms win out because of the more formidable foot gear! When groups of turkeys are seen in the fields during the breeding season, the Toms are in one group displaying, the Jake’s in another group a bit farther out and the hens are pecking for food and seem completely unimpressed. Male turkeys also have a unique feather dropping down from the center of its breast. It looks like a “fur” tail but is really a modified feather. Jakes also have these but are much smaller and less noticeable. 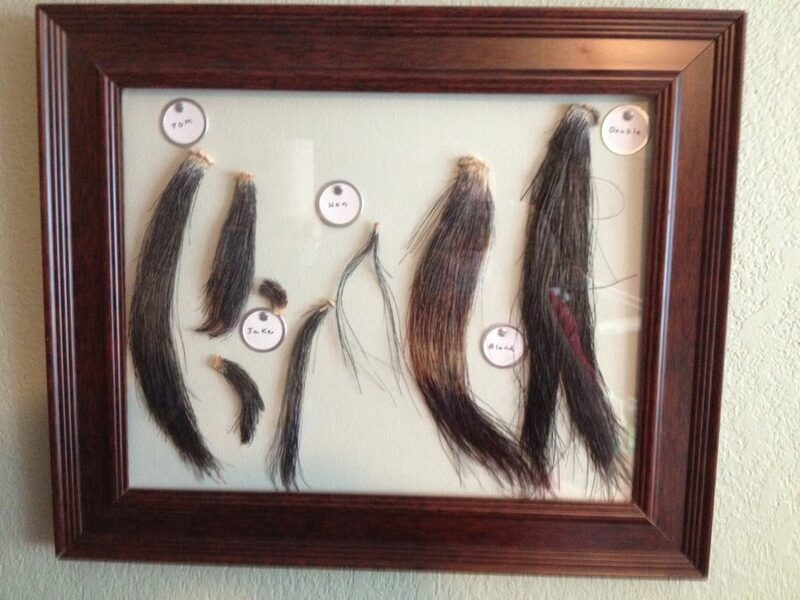 These are called “beards”. Female turkeys can also have a wispy beard and perhaps 10% of hens have them. Having a beard makes the turkey a harvestable bird in the spring even if it is a hen. Some turkeys can also have multiple beards to further complicate the issue. Calling in a Turkey in the spring is perhaps more exciting than deer hunting. Decoys are placed in appropriate places and the types of calls including box, slate, mouth and plunger types that can be used are endless. The expertise of the caller often spells the difference between a turkey dinner and a peanut butter and jelly sandwich! Once the turkey is harvested the “fun” begins. If it is a Jake, I usually skin or pluck the bird and prepare it like a regular store-bought bird. If it is an older one, I will breast it out and cook it in a slow cooker. If you really want a treat, cut the breast into bite-size pieces, bread and deep fry. This will compare to the best Nugget on the market and make excellent appetizers. The thighs and legs can be prepared to perfection in a slow cooker, or at times I will cut off the meat and run it through a grinder. Mixing with spices, using a “shooter” to form it and cooking it in a dehydrator makes some of the best turkey jerky imaginable! Beside the edible parts of the turkey, there are lots of parts that can be used for crafts and displays. 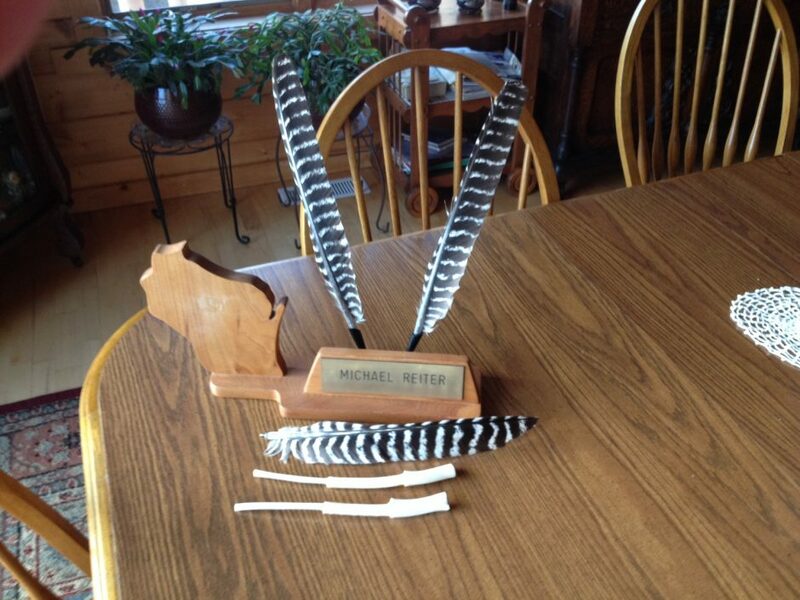 I will cut off the fan tail at the base then pull each feather off individually on the top and bottom of the fan. I separate the primary tail feathers, making sure that they are laid down in order with no meat of skin at their base. Using a piece “wet-dry” sandpaper cut to the appropriate size I then hot glue the fan back into the original shape and conformation. 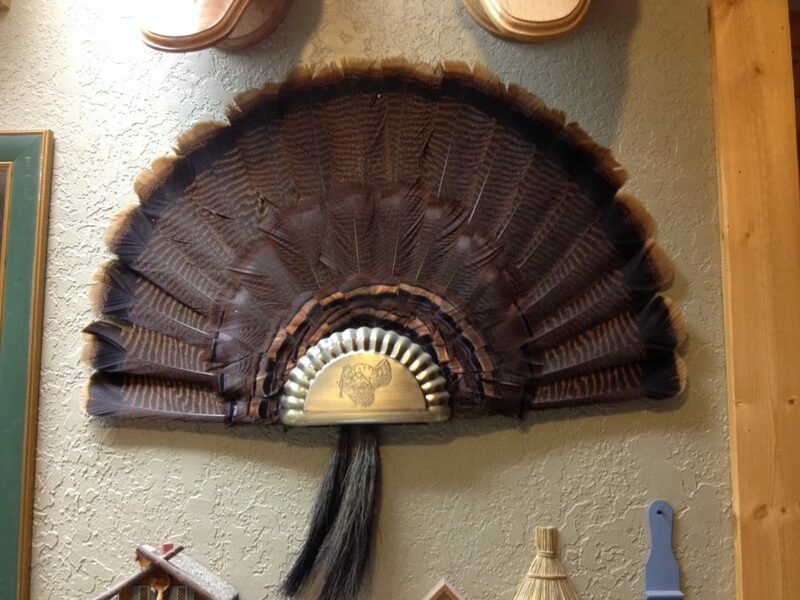 Doing it this way will preserve the fan for years and provide a valued reminder of the harvested bird. I learned this procedure from a good friend of mine, Ron Roettger, who I consider the premier turkey hunter in Wisconsin. I’ll also take the larger wing feathers and drill out the base far enough to insert a ball point pen refill. Adding a wooden base makes this a novel feathered pen desk item that actually works. I was shown this application by another good friend, John Lamb, who also knows his stuff when it comes to hunting gobblers! I’ll remove the three wing bones of the turkey that corresponds to the radius, ulna and humerus, boil off the soft tissue, cut off the knob and fit them back together and glue them to form a long tube. This can be used as a turkey call on upcoming hunts. This call is a on a par to any store bought call! I also save the remaining feathers to donate to schools for use as art projects. Nothing goes to waste! The turkey reintroduction back into our state ranks up there as the shining example of what can be termed a remarkable success story!